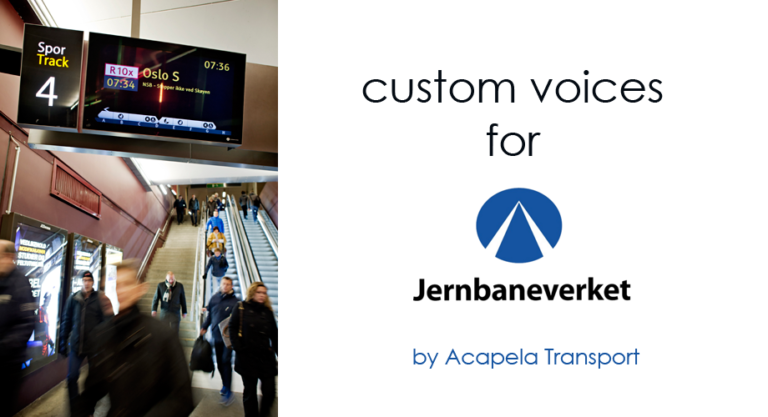 Acapela Group » Custom voices for public transport: Norwegian Jernbaneverket informs its passengers with its own exclusive voice, created by Acapela Transport. Custom voices for public transport: Norwegian Jernbaneverket informs its passengers with its own exclusive voice, created by Acapela Transport. Jernbaneverket, the Norwegian government’s agency for railway services, is informing its passengers with a custom Text to Speech program, based on an employee’s voice. Hear more about the particular approach run by the company to provide users with an efficient and pleasant Real Time Passenger Information System. Internal casting, selection process, recordings and creation of a tailor-made voice of a Jernbaneverket employee by Acapela: Read the full story. 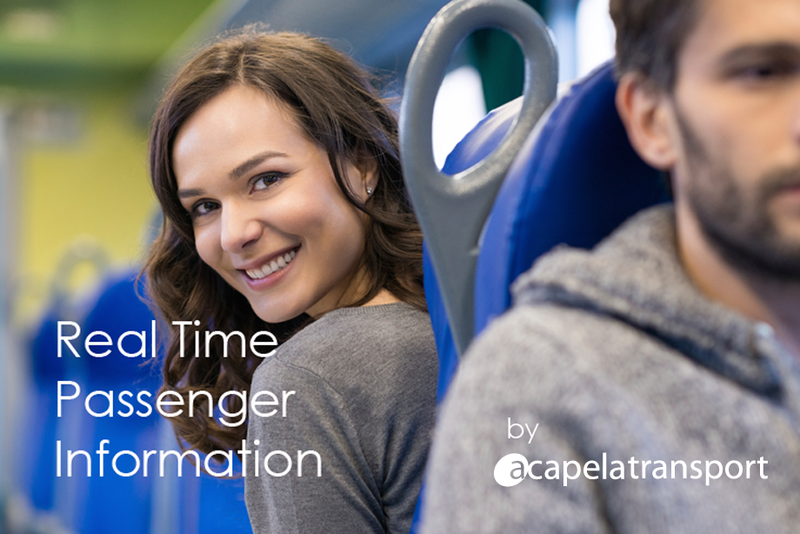 Jernbaneverket contacted Acapela Transport to accompany them in their voice project for an enhanced Passenger Information System. Acapela Group is experienced and well known for its expertise in creating custom voices. Usually the speaker is a professional voice talent. 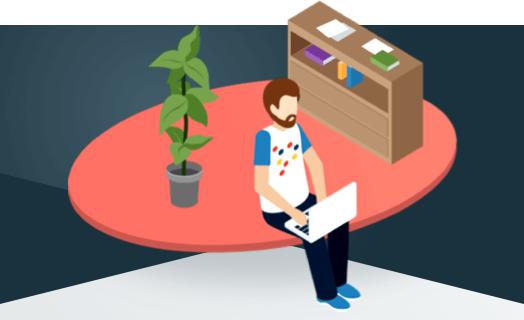 In the Jernbaneverket project, the voice talent is an employee from the agency, which is a human touch that pleased us at Acapela. So for the first time ever in our public transport activities – and after Jernbaneverket’s in-house voice talent passed all of Acapela’s evaluation tests with flying colours! – We get into the story! ‘The creation of this custom voice has been a great challenge and achievement for Acapela Transport. The speaker’s voice, which was selected following an internal casting of Jernbaneverket’s employees, embodies a personal touch of the Norwegian National Rail Administration’ says Lars-Erik Larsson, CEO of Acapela Group. In addition to regular Voice Factory development at Acapela, a specific evaluation process and transport-domain recordings were made using Acapela Transport’s dedicated tools to perfectly restitute station names and passenger information for an enhanced user-experience. In partnership with Funkwerk, who won a bid to supply a modern nationwide passenger information system to Jernbaneverket in 2014, 338 train stations will soon be using Acapela voices to deliver real time passenger information: the custom voice for the Norwegian users and an English voice from the Acapela catalogue for the international travelers. Specific linguistic work was performed to perfectly pronounce Norwegian train station names in both Norwegian and English. Special attention was given to closely restitute them to Norwegian users as well as to make sure that non-Norwegian speaking users would understand the Norwegian names while traveling. Jernbaneverket was actively involved in the quality process throughout the duration of the project. A specific lexicon tool has been provided by Acapela Transport, to enable Jernbaneverket to add pronunciations of new station names and words, in both languages. This innovative and tailored approach, conducted in partnership between Jernbaneverket and Acapela, results in a voice that surpasses the standard quality Acapela voices by an average of 30% when used for passenger information. ‘ Acapela Transport accompanied us the full way, step by step from the casting up to the recordings of the Jernbaneverket-specific corpus. Pleasant voices are now deployed to inform our passengers with highly accurate audio restitution, resulting in, we hope, a pleasant traveling experience’ says Victor Hansen, Head of Customer and Traffic Information at Jernbaneverket.